Less than a quarter of a mile south of Grandma and Grandpa Snyder’s place, during the first few years of my life, up through kindergarten, we lived on the Paxton place. I was probably not quite two when we moved there. Gloria was born while we lived there, I’m sure, one week shy of two years younger than I. 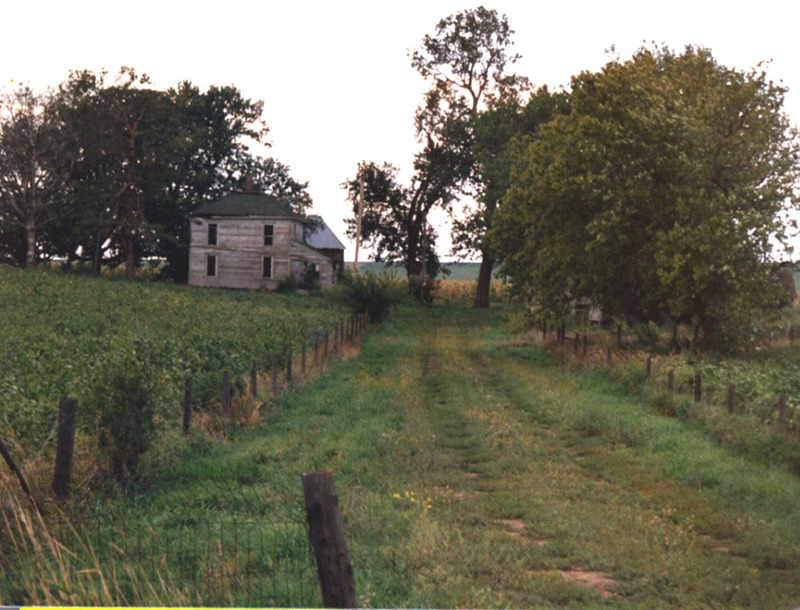 Dad and Mom were tenant farmers on the 80-acre Paxton place and helped Grandpa and Grandma farm their 160 acres. Not much of a house: four rooms, one, a long narrow passageway on the north, a slanted lean-to along the north side of the house, where in winter the only thing that kept us from freezing was the constant fire in the cast iron stove on the north wall. Also on the north wall was a window; another on the east that overlooked the yard and garden The only entrance door was on the west wall with a cement stoop outside; off which the sidewalk ran straight to the gate. A large porcelain kitchen sink bolted to the south wall, to the right of the door that led into the only other downstairs room, a sink big enough for dishpans to wash and rinse, pans full of dirty clothes soaking, butchered chickens. Not a pure white sink, but one with dents and scratches from cast iron pans, knives being dropped. No, there was no faucet, no running water to the sink. Only a sink. But there were two pumps: a small cast iron pump inside bolted on the built-in immense work able across from the sink, like a dilapidated make-shift one found in a poor handyman’s workspace; another pump outside by the cistern. Over that sink my mother tended to a burn blister on my finger. I don’t know how it got there: messing with something, more than likely a grease spatter from being too close to the stove. Before Mom took a needle to the blister, she told Gloria not to look. Gloria did. I remember her peering over the sink just as Mom lanced the blister and blood and ooze dripped into the sink. Gloria fainted dead away in a crumpled heap. Fainting, never me. 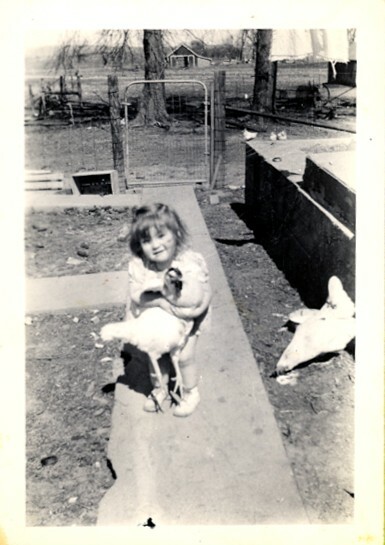 My little sister, Gloria, was sickly for most of her childhood–pernicious anemia. One of the cures then was forcing her to eat raw liver. Gloria’s anemia and resulting weakness often meant that after she started school, when we lived on the Beh place, Dad had to take us to and fetch us from Greeley #1 in a horse and wagon, rather than we being required to walk. In that passageway, next to that long table and the stove, were shelves for storing things, a porcelain Hoosier on which Mom kneaded bread dough and made pies, and an ice box. Later Mom had the icebox cut in two and had one of the sides made into a lid. In that porcelain-lined box, Mom kept flour. A 50-pound bag filled it to the brim. Mom stored the ringer washer and the washtubs on the southwest wall of the lean-to, dragging them outdoors during the spring, summer and fall. After the clothes were washed and hung out to dry, Mom dumped the wash water on the sidewalk and scrubbed the walk clean with a corn broom. She washed clothes in the house on cold, stormy, snowy days. In the winter, once frozen sheets and clothes thawed on lines strung like a cat’s cradle back and forth across the living room. In that lean-to we kept baby chicks for the first few days. Most of the hens cackled in the chicken house; others roamed free, dropped eggs in the grasses that we searched to find. Roosters everywhere. Eggs were candled in that lean-to, wire buckets full. Milk was separated, the constant hum before supper time. Walking straight north out of the gate, a gate that didn’t keep much in, led us straight across the plank over the ditch and to Grandpa’s machine shed and granary. There was only one other room on the main floor. In that room on the other side of the kitchen wall was a player piano, left there by previous tenants. Positioned towards the east and south of the piano, barely enough room to get around, was a large table, covered in oilcloth and that covered with lace on special occasions. Around that table we ate our meals; the piano bench scooted next to the table for someone to sit. Assorted dressers and end tables roamed the perimeter, chairs, and I’m sure a radio; On the west wall was Mom and Dad’s bed. Upstairs were two rooms, one in which I slept, one that still haunts me today. 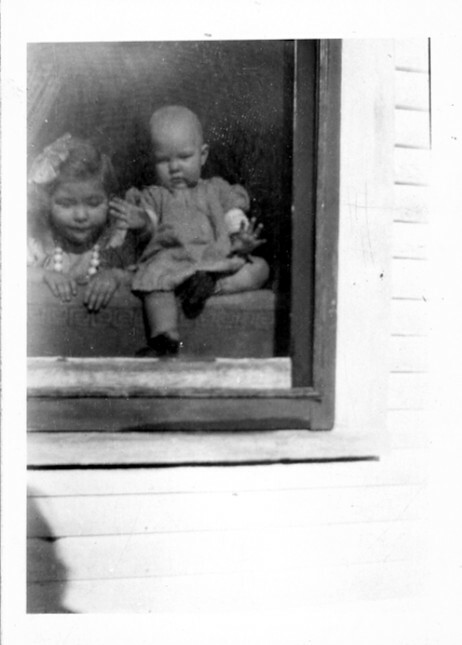 I remember at age five Mom coaxing me to walk down the lane, then north to Grandma’s when my mother headed once again to Foderberg’s house in Manilla to give birth to my older brother. I cried sopping tears as I kept looking back at my mother waving at me and telling me it will be alright. That long lane down which I walked seemed endless, so did the trek to Grandma’s. At that time, after the birth, Mom was gone for a week. In that lane I dropped an anvil on my toe. I don’t know why I was carrying it. More than likely I just picked it up, but I could have been told to take it to Grandpa. The house has been torn down a long time ago, the barn before that, and any granaries. Our barn was straight across the lane in the grove of trees, where Dad milked cows, but I don’t know what else. We had an Allis Chalmers with spoked wheels, no rubber; later a John Deer. Grandpa still farmed with horses most of the time. We might have had our team of horses then, but we did have them on the Beh place. From that barn my older sister, 11 years old than I, ran screaming. In the hay loft above where Dad was milking cows, newly hatched garter snakes streamed down the hay into her hair.